I recently completed a special sketchcover to celebrate the Comic Book Central podcast’s 4th anniversary. I listen to the podcast a lot while working in my Batcave studio, and occasionally email the show. 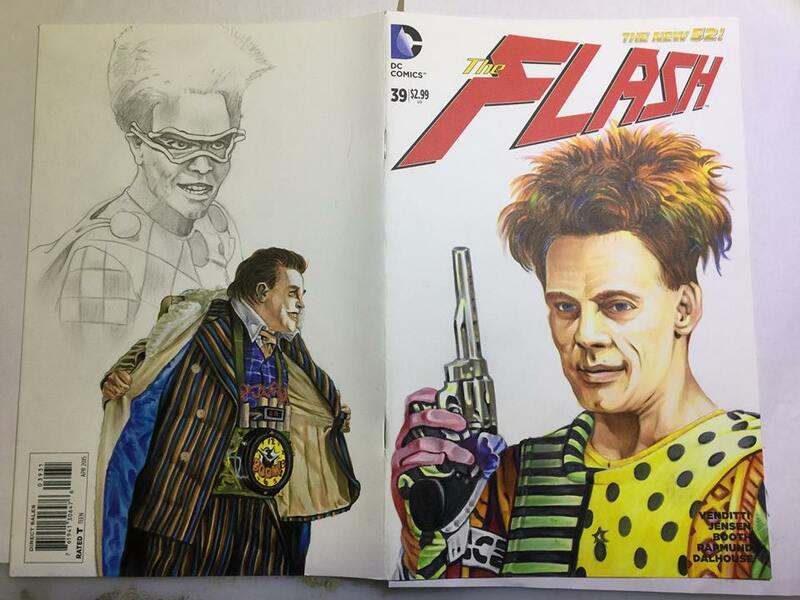 I asked CBC’s host Joe Stuber if he’d like to do a sketchcover giveaway. He’s done special prizes for other giveaways over the years, and dug the idea of doing a comic. He suggested it should be a guest from this past year’s interviews. We both agreed Mark Hamill would be a fun choice. 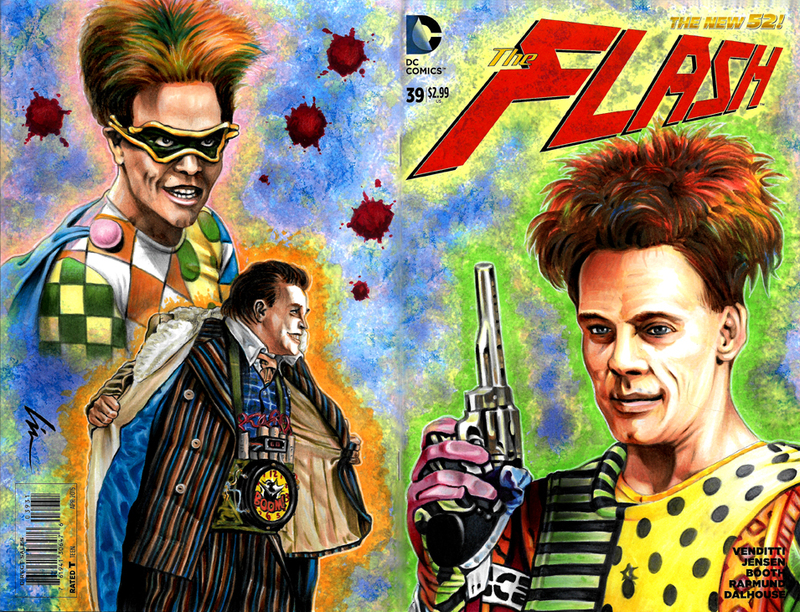 I loved him as the Trickster on the original CBS Flash TV series back in 1990, and was happy to see him make guest appearances on the new CW Flash series. 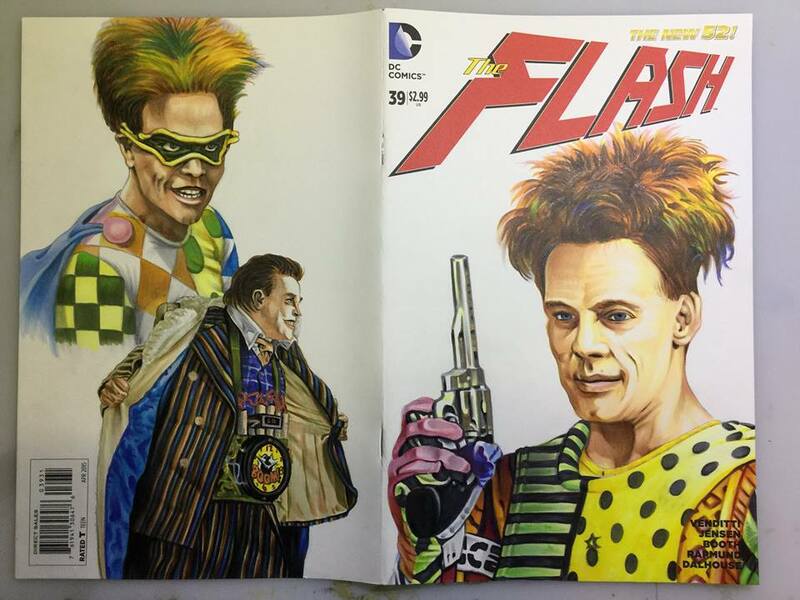 I did a version of his first and second appearances on the ’90s Flash show, and one of him as the Trickster of Earth 3 (although he looks kinda like the “Jokester“) from the current show. I thought about adding his latest non-costumed “Jesse James/Trickster” persona from the current show, but felt it may become a bit crowded, so I just stuck with these three. 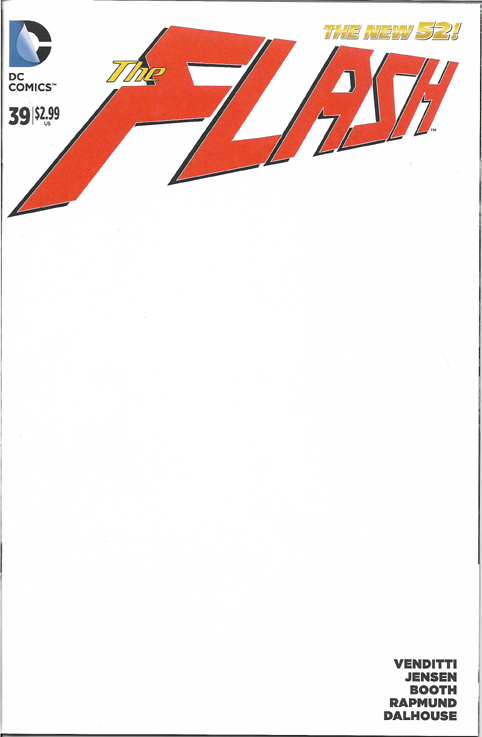 Sketchcovers are regular comics on the inside, but with a blank cover that only has the masthead/logo, company name, and price on the front, and usually just a bar-code on the back. You can draw or paint on them with pencils, inks, markers, watercolors, or whatever medium you like. They are made for doing commissions, or just drawing covers you’d love to see. They are great for mash-ups, or just doing your own take on characters. They’re a lot like sketchcards, but with A LOT more room to be creative. I usually like to do a big portrait type image on the front, and then a couple smaller body shots on the back. Sometimes I’ll do a wraparound image. This time I did his 2nd appearance on the front, and then his first appearance and latest appearance on the back. I started off with just a No.2 pencil, and worked out a lot of the shading. Sometimes I just do line art and do all the shading with the markers. 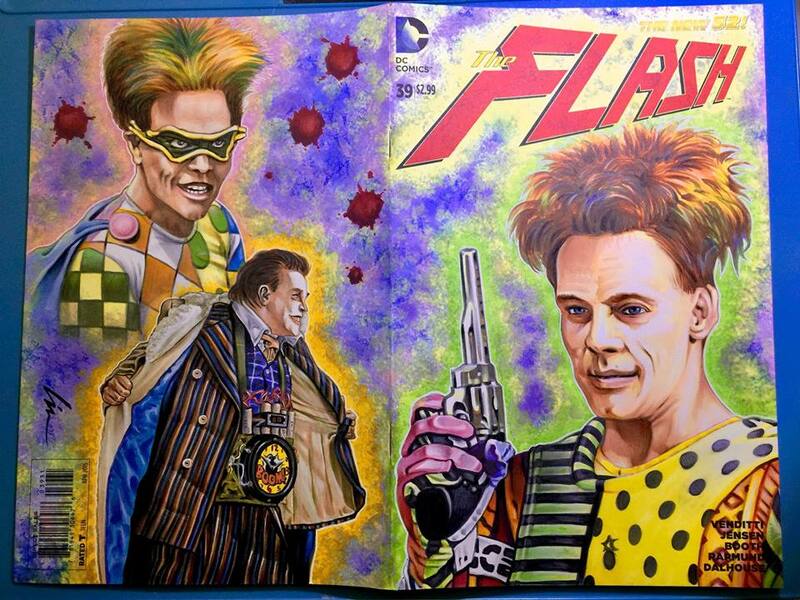 For this one I kept the costumes pretty tight and detailed, and kept the hair kinda loose in the pencil drawing. 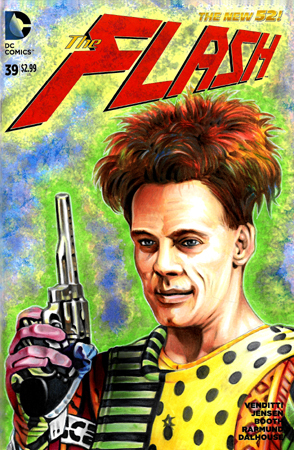 When I got most of the front done I moved onto the Earth 3 Trickster. The pattern on the coat was a little tricky to draw at first, but once I knew the repeating pattern of the colors it was just a matter of keeping focused. I used some flesh-tones in the shading on the jacket lining and suit stripes, and a few different shades of blue for the lining and stripes. 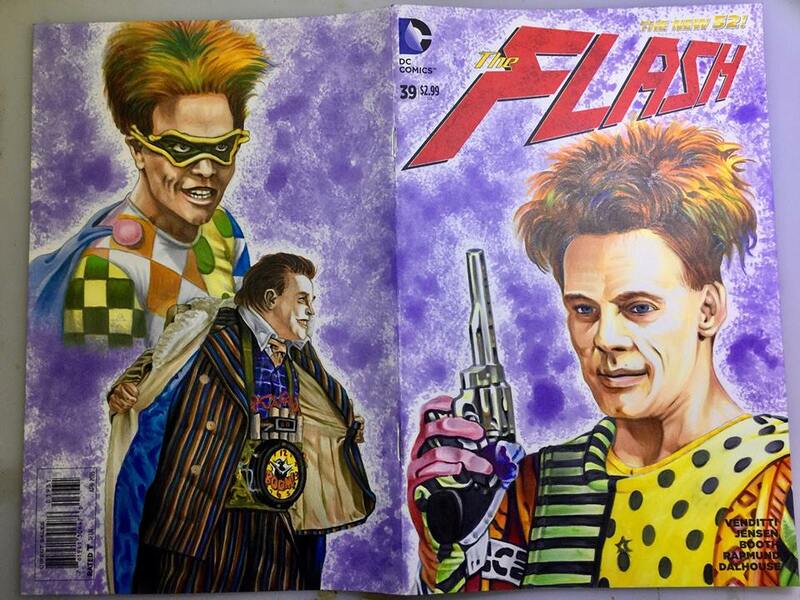 Of all of the Tricksters on the comic, I think this one was my favorite to draw- even with ALL those stripes! 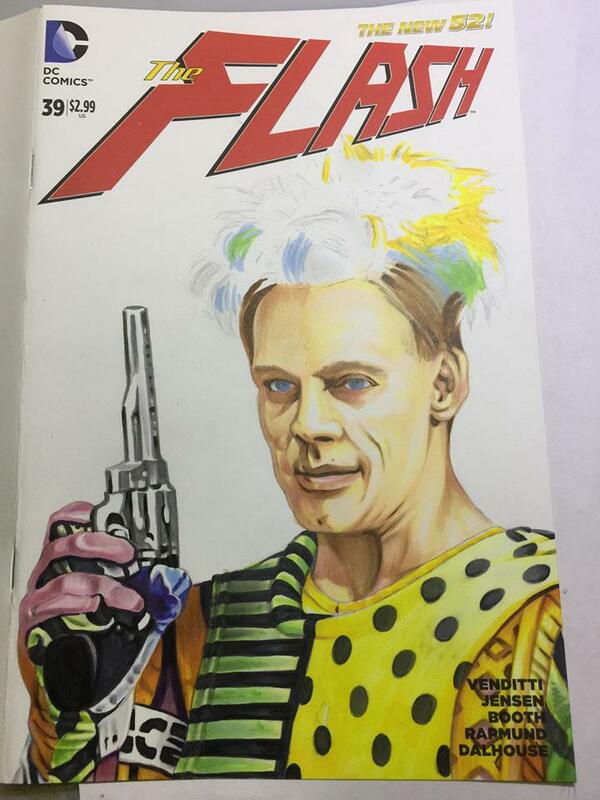 After Earth 3 Trickster was rendered out I started working on his first TV appearance. I was happy with the way the squares on his shoulder turned out. Not a super important detail, but sometimes it’s the little things that make me happy. 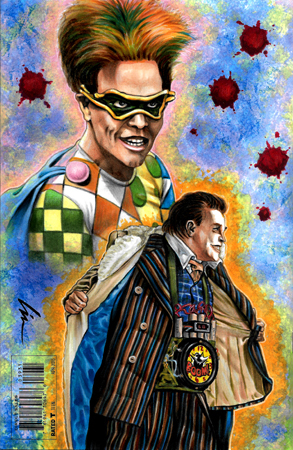 The white background looked a little too tame for a Trickster cover- needed to be a lot busier and more colorful. 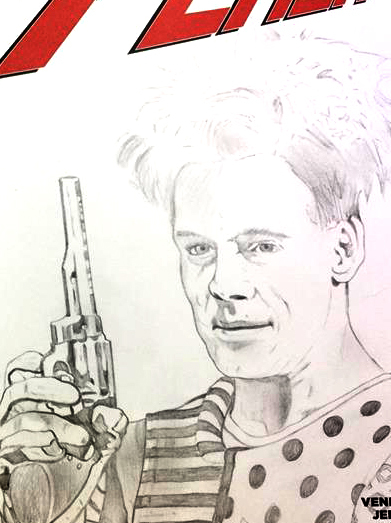 Mark Hamill had interviewed Jim Lee on an online show I watched and Jim used some toilet paper and a black Copic marker refill to do an effect on a Joker sketch. I really dug it and decided to try it out on this illustration. 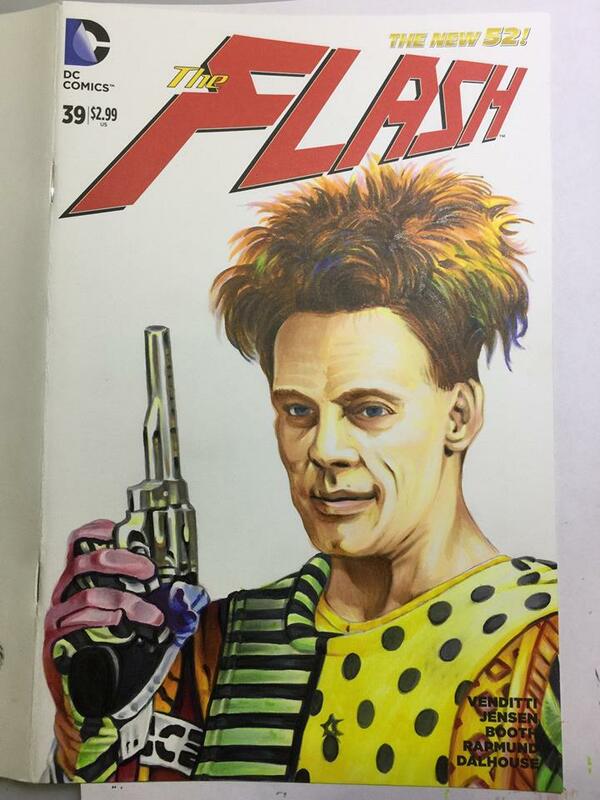 I would drop a little ink on the TP, dab it on the cover, turn, dab, and repeat until I had filled in the whole background. I left a little bit of white around the characters. I then took pink, golden yellow, green, and light yellow markers and outlined the figures and logo- and lightly blended the colors with the background effect. I stippled a slightly darker blue here and there in the background using the same previous technique withe the toilet paper and refill bottle. I wasn’t happy with the space along the spine of the comic- it looked a little “dead”. So I took a red refill and dropped a little “blood” onto it. Once I did a few more details with the markers, I came back with a white Prismacolor pencil and a white Gelly Roll pen and did some highlighting. After the drawing was done I sprayed it with a fixative to seal and protect it. Joe Stuber mentioned me and the upcoming giveaway in a teaser last weekend on Ep.196, and then made the big announcement on Ep.197 this weekend. 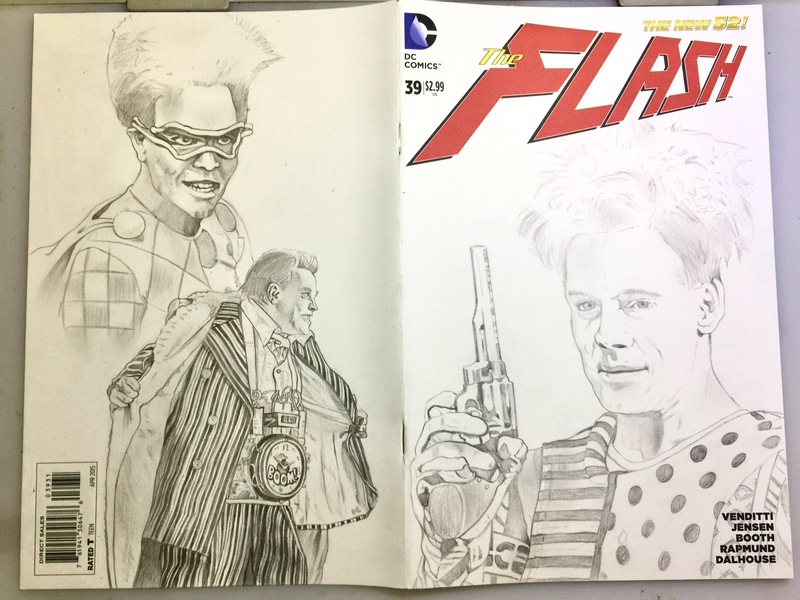 If you’d like to have a chance at winning this one of a kind sketchcover, head on over to the CBS lair and check out some of this year’s episodes, and then email Joe which moment(s) were your favorite. Lots of great ones to choose from, and you’ve got a couple weeks to enter the contest. And be sure to check out some of the episodes from other years, too. Joe’s first episode was with Stan Lee! I wish you good luck- and good listening!